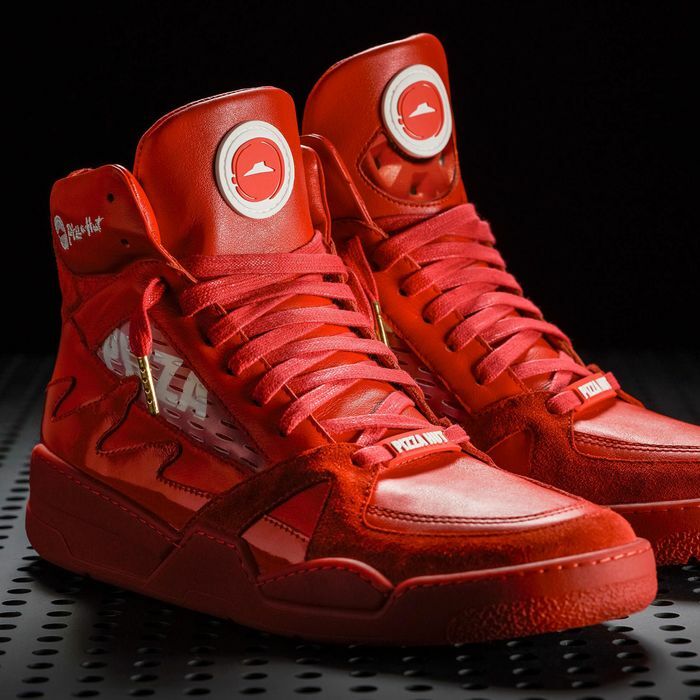 It’s been a year since Pizza Hut unveiled Pie Tops, the world’s first sneakers that will, for some reason, order you pizza. The Bluetooth-enabled smart shoes raised myriad questions about where, how, and why exactly such a feature would be used — none of them ever really got answered, but hey, March Madness is back once again, and that apparently means Pizza Hut’s kicks are, too. For 2018, they’re returning in super-limited-edition release of just 50 pairs, in either a very intense marinara-red or pizza crust–y tan colorway; both come with “cheese grater mesh” on the side, and branded Pizza Hut laces. Just like last year’s pair, the shoes themselves link to the wearer’s phone — a simple press of a button on the tongue “instantly submits” a pizza order. The big 2018 update is that a second button has been added to the left shoe that’s capable of pausing live TV. This solves the problem of what to do if you order a large pizza (either purposefully or by complete accident) that arrives in the second half’s final 30 seconds with Villanova down by two. Now, the Pie Tops II give you a chance to “call your own timeout” using a Pizza Hut shoe linked to your cable provider, to retrieve your Pizza Hut product, then to maybe spend a few moments thinking about your life choices before jumping back into the final seconds of the game.